The structure of single walled armchair and zig-zag carbon nanotubes having 70 atoms and two carbons replaced by boron or nitrogen is obtained at minium energy using HF/6-31G* molecular orbital theory. The calculations show that the ground state of the zig-zag tubes is a triplet state while for the armchair tubes it is a singlet. In the zig-zag tubes the density of states at the Fermi level is greater for the spin down states compared to the spin up state indicating that the doped tubes could be ferromagnetic. The switching elements in computers, metal oxide silicon field effect transistors, involve turning of and on the flow of current in the form of holes and electrons. On the other hand the storage of data employs a separate material consisting of nanosized magnetic materials. There is considerable interest in combining storage of information and switching into one material by developing magnetic semiconductors referred to as dilute magnetic semiconductors. There have been a number of reports presenting evidence that semiconductors such as GaP, GaN, GaAs and ZnO when doped with Cu2+ and Mn2+ are ferromagnetic [1–5]. An alternate approach to developing magnetic semiconductors might be to explore the possibility of making single walled carbon nanotubes (SWNTs) ferromagnetic by appropriate doping of other atoms for carbon on the walls of the tube. SWNTs can be viewed as sheets of graphene rolled into tubes which can be microns in length and have diameters from 5 A to 20 A. The tubes may be metal, insulating or semiconducting depending on their chirality. There is much interest in developing electronic devices based on SWNTs and in fact a field effect transistor has been demonstrate using SWNTs . The tubes may be N or P doped by substituting nitrogen or boron for carbon in the walls of the tubes. However there is little experimental data on the electronic properties of such doped SWNTs. One particularly interesting report is the observation of ferromagnetism in nitrogen doped SWNTs opening the possibility of their use as DMS materials . This result motivates a further investigation of the electronic and magnetic properties of boron and nitrogen doped SWNTs using molecular orbital theory. There have been a number of theoretical treatments of carbon nanotubes employing molecular orbital theory ranging from the semiempirical AM1 method to density functional theory (DFT) [8–11]. The size of the tube needed depends on the property that is to be calculated. The prediction of properties of side wall functionalized tubes generally requires at least a tube having 70 atoms. On the other hand the properties of tubes functionalized at the open ends can be predicted with much shorter tubes. To the best of our knowledge there have been no investigations of the effect of boron and nitrogen doping on the electronic or magnetic structure of SWNTs. The structures at minimum energy of zig-zag (7,0) and armchair (5,5) tubes are obtained using the Hartree Fock method employing a 6-31G and 6-31G* basis set. The 6-31G* is a single point calculation on the optimized 6-31G structure. This approach rather than a DFT model is used so as to minimize computer computation time. The calculations were performed using the Gaussian 03 software package . Figure 1a shows the optimized structure of a C68B2 armchair tube and Fig. 1b a zig-zag tube at minimum energy showing the location of the boron substitutions. Similar structures are obtained for SWNTs doped with nitrogen at the same locations as the borons. Table 1 compares the energy difference between the singlet S = 0 and triplet S = 1 states for both the armchair and zig-zag tubes. A plus sign indicates that the total energy of the tube is lower for the triplet state. The results show that the triplet state has a lower total energy for the zig-zag tubes but not the armchair tubes. 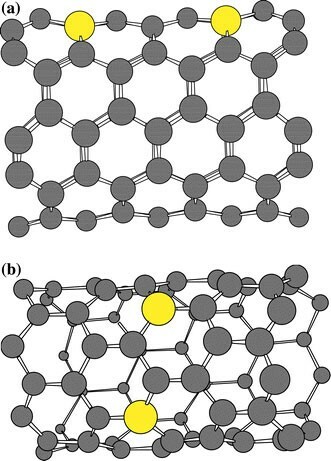 It is noteworthy that the triplet state is considerably lower than the singlet in the nitrogen doped carbon nanotubes by 4.23 eV compared to the boron doped tubes which is only 0.75 eV lower. While the existence of a triplet ground state in the zig-zag tubes does not in itself prove that the tubes will be ferromagnetic it does suggest the possibility. A further evidence for the possibility of the existence of ferromagnetism in the doped tubes is that the density of states at the Fermi level is larger for the spin down state compared to the spin up state. In the boron doped tubes the density of states of the spin down state at the Fermi level is 4.28 states/eV compared to 3.62 for the spin up state. Since the boron doped tubes are hole doped this suggests that carbon nanotubes could be dilute magnetic semiconductors when incorporated into field effect transitor devices.